The direction of flowing water has an incredibly strong impact on the Vaastu of a property. 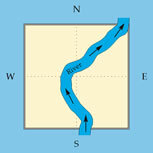 Rivers, streams and creeks must flow to the north, east or northeast when they are on or near a property. Determining the Vaastu of flowing water requires great skill as it is a very powerful feature-either very positive or very negative. Results: Very Auspicious. One of the most beneficial features in all of Vaastu. Brings tremendous prosperity, material and spiritual success, name, fame, happiness and all angles of great fortune. Benefits: Very Auspicious. This river has both auspicious placement and direction of flow. Brings tremendous prosperity, success, name, fame, happiness and all angles of good fortune. Benefits: Very Auspicious. 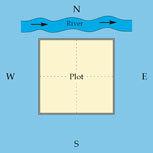 This river has both auspicious placement and direction of flow. Brings enormous prosperity, success, brilliant thoughts, peace, happiness and good fortune. Results: Dangerous. 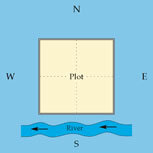 Although the river is located in a positive direction, it flows south and, therefore, is unacceptable. Water in the east will bring some benefits but the south flow will cause depression, anxiety, illness, financial problems and accidents. Results: Very Dangerous. 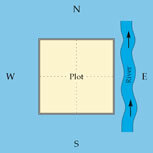 The river has both negative placement and flow. Causes unnatural deaths from accidents, chronic illnesses and suicides. Enemies, financial loss, depression, defamation and relationship problems will occur.